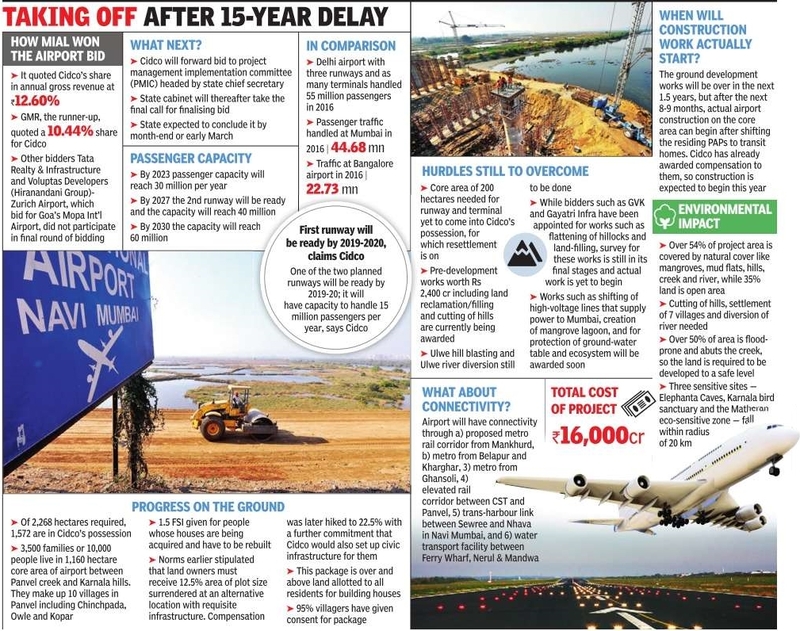 After a delay of one-and-a-half decades, the Navi Mumbai international airport project is finally on track. The GVK-led Mumbai International Airport Ltd won the bid for the Rs.16,000 crore project, offering a 12.6% share in revenue to the nodal agency, Cidco, which is executing the project. The only rival in the fray was GMR Group, which offered 10.44%. Cidco will now forward the bid to the project management implementation committee, headed by the state chief secretary . The state cabinet will then take a call on finalising the bid. The state is expected to conclude the process by the month-end or early March. MIAL, of which the Airports Authority of India (AAI) is a partner, had earlier redeveloped the domestic and international airport terminals at Santacruz and Sahar and currently operates the Chhatrapati Shivaji international airport. 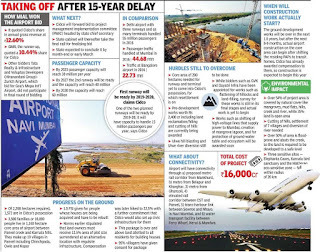 Chief minister Devendra Fadnavis had said last year that the first flight from the airport would take off by the end of 2019, but experts said several issues still needed to be worked out. The GVK group had been given the first right of refusal by Cidco as they operate the local city airports, and in case their bid came within 10% of the best one, they could still lay claim to the bid. GVK also won the tender for cutting a portion of the Ulwe hill to make way for the runway .The airport will have two parallel runways, 3.7 km-long each. It will have an aircraft parking capacity of 104. Tata Realty & Infrastructure and Hiranandani Group, which were earlier in the race and had qualified for the financial bids, did not submit their offers on Monday . The bidding process was delayed for several months because Cidco was forced to twice extend the bids when it failed to attract more bidders. Tata and Hiranandani had both raised several issues about the timelines and cost overruns. Both the companies also expressed concerns about the consequent impact on the cost of the project and whether the estimates provided by the government were sufficient. GMR too had complained that more than 3,200 families were yet to be relocated from the site before work starts. The Navi Mumbai International Airport will be executed on a public-private-participation basis through a proposed special purpose vehicle.While Cidco has designed the airport, GVK will build, operate and transfer the entire project after 30 years. As per Cidco consultants, the passenger count is expected in the first year of operation at 15 million, which will increase to 30 million in 2025 and to 40 million in 2030. The maximum count is pegged at 60 million in 2035. India's domestic market is on track to surpass 100 million passengers in financial year 2017 alone and will touch 130 million in 2018. From January to December 2016, Delhi handled a total of 55 million passengers (domestic and international included), while Mumbai, the second busiest airport in India, handled 44 million.